Throughout his career Govert Flinck primarily focused on two genres, history painting and landscape, in both of which he was highly regarded and economically successful, bringing him fame and a good income. In the field of history painting he depicted Old and New Testament scenes, as well as secular and mythological ones, while also painting figure studies. Moltke’s monograph on the artist only records two autograph landscapes and that author rejected five others including the present panel. Nonetheless, old inventories drawn up in Amsterdam shortly after the mid-1650s indicate the presence of landscapes by Flinck. The present panel was published in 1927 when it was auctioned in London, appearing in the sale catalogue as a work close to one of Rembrandt’s collaborators. In 1934 and after having passed through two further collections it was auctioned again, this time in Lucerne, where it was catalogued as a signed work by Flinck. It was acquired for the Thyssen-Bornemisza collection that year from the Böhler & Steinmeyer gallery in Lucerne. In the 1969 catalogue of the Collection, Ebbinge-Wubben questioned the attribution in his entry. He based his opinion on a comparison of the backgrounds in other works by the artist, particularly the one in Mercury and Argus in the Rijksmuseum, Amsterdam. 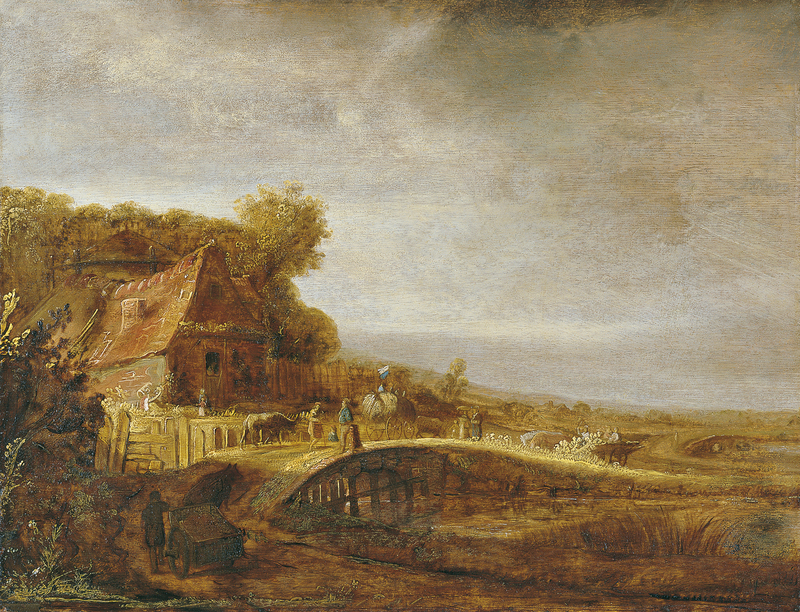 As a result he concluded that an attribution to Flinck was not convincing and that the landscape clearly revealed the influence of Rembrandt in the 1640s. Having studied its provenance and the earlier references to the painting, Gaskell opted to attribute it to Flinck with some reservations. He pointed to various significant features including the fact that two landscapes were considered to be by the artist, one in Boston of a Landscape with an Obelisk and the other in the Louvre of a Landscape with a Bridge and Ruins. Gaskell considered this fact a reason to reconsider the issue of landscapes within Flinck’s oeuvre. Secondly, he noted the interest in tonal views among Haarlem painters in the 1630s, while thirdly he pointed to the parallels between the present panel and one by Isack van Ostade of Landscape with a Bridge, suggesting that the subject was popular with Haarlem painters.